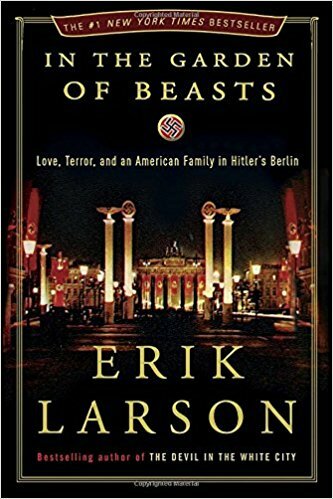 This is my first Erik Larson book. It is a disturbing look of Hitler’s first year in power. The book follows the appointment of William Dodd as the Ambassador to Hitler’s Germany in the year after Hitler rose to power. It follows William Dodds transformation from an admirer of Hitler to his efforts to fight the rising anti-semitism in Germany. Curiously He expressed anti-semitism views his whole life. It also includes the adventures of his flamboyant daughter, Martha. She is interesting to say the least, Martha has affairs with many different people including the first chief of the Gestapo, Rudolf Diels. They go from a view the Nazis can’t be that bad to the beginning of an understanding of the evil that is the Nazis. When they arrive in Berlin they witness a march of brown-shirts holding torches and people who don’t stop to watch and do the Heil Hitler are hit or beaten. In one chapter Martha stumbles upon brown-shirts holding a march where a woman who was engaged to a Jewish man head is shaved and then marched through the streets for punishment. At one point Ambassador Dodd believes he sees a moderating of the treatment of the Jews. He is told by Nazi officials if he can stop Jewish protests in America then that will help stop the Jew persecution. He stops a protest in Chicago – while on leave – and within days the Nazi leader Goring states in a speech that Jews are the syphilis of Europe. Dodd begins to see that the Nazi leaders blame all problems on Jews, non-aryans, or foreign governments trying to undermine Hitler. Dodd and Martha see a rise of the Nazi leaders spreading fake news and history to strengthen their hold over their supporters – such as claiming 300 German-americans were killed in just one incident when the US entered World War I. They observe how the Nazi leadership is unable to take any criticism and how they lash out at those who disagree with them as traitors or vow that they will be punished. Any criticism of Hitler in the press is label an attack with no basis in fact. The Nazi quickly bring all the press under there control through censorship laws and terror. Dodd also observed how Hitler claimed to be the only possible leader who can lead Germany. He’s a quote from a Hitler speech from the book “That you have found me among so many millions if the miracle of our time and that I have found you, that is Germany’s fortune”. Eventually the Dodds see the Nazi’s for what they are. After the Germans get Dodd removed from his post. Dodd acurately predicts the course that Germany will take. He predicts their eventual efforts to kill all Jews, their invasion of Austria, Czechoslovakia, Poland, and then all of Europe.